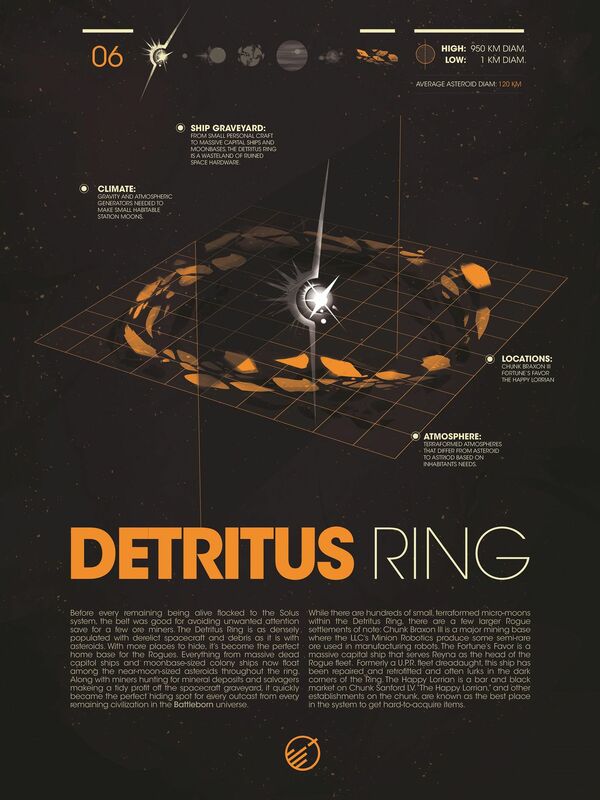 There’s no better place in the universe – even a shrinking universe – for someone to hide than The Detritus Ring. Before every remaining being alive flocked to the Solus system, the belt was good for avoiding unwanted attention save for a few ore miners. These days, the Detritus Ring is as densely populated with derelict spacecraft and debris as it is with asteroids. With more places to hide, it’s become the perfect home base for the Rogues. One could say that the Detritus Ring is a wretched hive of renegades, criminals, and survivalists. Just don’t quote us on that. What happens when the remaining beings in the universe cluster around one star? Besides interstellar overcrowding, everyone’s refuse has to go somewhere – and in this case, the Detritus Ring became a safe dumping ground. Everything from massive dead capitol ships and moonbase-sized colony ships now float among the near-moon-sized asteroids throughout the ring. Along with miners hunting for mineral deposits and salvagers making a tidy profit off the spacecraft graveyard, it quickly became the perfect hiding spot for outcasts from the universe’s remaining civilizations. The best way to describe the Rogues is a loose confederation of like-minded miscreants. As such the miners, salvagers, thieves, and hermits formed an uneasy alliance simply so that they can be left alone to do what they please. Chunk Braxon III is a major mining base on one of the larger chunks. They produce some semi-rare ore used in manufacturing of robots that gives Minion Robotics (and therefor the LLC) a stake in protecting the colony. Enough wealth flows through this colony that many notable Rogues frequent here as a mainstay of embezzling, theft, and other dips into the LLC cash flow. The Happy Lorrian is a bar / black market on Chunk Sanford LV settled principally by members of the orange-skinned and multi-limbed Lorrian race. “The Happy Lorrian,” and other establishments on the chunk, are known as the best place in the system to get hard-to-acquire items and meet…how does one say it?…obtainers of rare antiquities. Learn more about the Rogue faction and the inspiration behind their design.